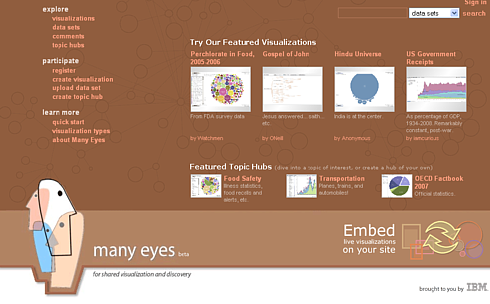 Many Eyes was a free site where anyone could upload, visualize, and discuss data. It was an experiment created at the IBM Visual Communication Lab, running from 2007 - 2015. The New York Times covers Many Eyes: "Lines and Bubbles and Bars, Oh My! New Ways to Sift Data," Anne Eisenberg, Aug. 31, 2008, p. B4. Many Eyes: A Site for Visualization at Internet Scale, Fernanda B. Viégas, Martin Wattenberg, Frank van Ham, Jesse Kriss, Matt McKeon. Infovis, 2007. Your Place or Mine? Visualization as a Community Component, Catalina M. Danis, Fernanda B. Viégas, Martin Wattenberg, Jesse Kriss. CHI, 2008. Emerging Graphic Tool Gets People Talking. Martin Wattenberg and Fernanda Viégas. Harvard Business Review, May 2008. Harry Potter and the Meat-Filled Freezer: A Case Study of Spontaneous Usage of Visualization Tools, Fernanda B. Viégas, Martin Wattenberg, Matt McKeon, Frank van Ham, Jesse Kriss. HICSS, 2008. Data visualization has historically been accessible only to the elite in academia, business, and government. But in recent years web-based visualizations--ranging from political art projects to news stories--have reached audiences of millions. Unfortunately, while lay users can view many sophisticated visualizations, they have few ways to create them. 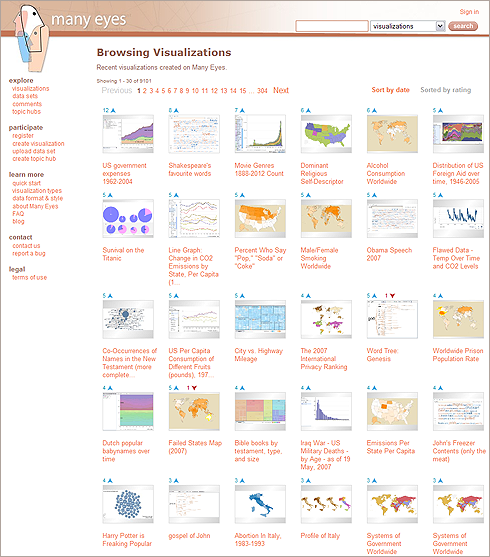 To "democratize" visualization, and experiment with new collaborative techniques, we built Many Eyes, a web site where people may upload their own data, create interactive visualizations, and carry on conversations. The goal is to foster a social style of data analysis in which visualizations serve not only as a discovery tool for individuals but also as a means to spur discussion and collaboration. The idea for the site came from experiences that Fernanda Viégas and I had in which visualizations had an unexpectedly strong social component. The papers and videos at left give a good account of what we learned. Although Many Eyes was decommissioned by IBM in 2015, its ideas live on in many other visualization products.